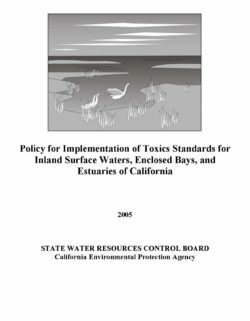 This state policy for water quality control (Policy), adopted by the State Water Resources Control Board on March 2, 2000 and effective by May 22, 2000 (See “Note” below), applies to discharges of toxic pollutants into the *inland surface waters, *enclosed bays, and *estuaries of California subject to regulation under the State's Porter-Cologne Water Quality Control Act (Division 7 of the Water Code) and the federal Clean Water Act (CWA). Such regulation may occur through the issuance of National Pollutant Discharge Elimination System (NPDES) permits, or other relevant regulatory approaches. The goal of this Policy is to establish a standardized approach for permitting discharges of toxic pollutants to non-*ocean surface waters in a manner that promotes statewide consistency. As such, this Policy is a tool to be used in conjunction with watershed management approaches and, where appropriate, the development of Total Maximum Daily Loads (TMDLs) to ensure achievement of water quality standards (i.e., water quality criteria or objectives, and the beneficial uses they are intended to protect, as well as the State and federal antidegradation policies). This Policy establishes: (1) implementation provisions for priority pollutant criteria promulgated by the U.S. Environmental Protection Agency (U.S. EPA) through the National Toxics Rule (NTR) (promulgated on December 22, 1992 and amended on May 4, 1995) and through the California Toxics Rule (CTR), and for priority pollutant objectives established by Regional Water Quality Control Boards (RWQCBs) in their water quality control plans (basin plans); (2) monitoring requirements for 2,3,7,8-TCDD equivalents; and (3) chronic toxicity control provisions. In addition, this Policy includes special provisions for certain types of discharges and factors that could affect the application of other provisions in this Policy.